San Casciano Val di Pesa, Tuscany - tourist information, history, travel guide, sights and vacation accommodation. San Casciano Val di Pesa is situated to the south of Florence near the valley of the river Pesa, Tuscany, surrounded by the neighbouring Communes of Scandicci and Impruneta (to the north), Greve in Chianti (to the east), Tavarnelle Val di Pesa (to the south) and Montespertoli (to the west). In the past it was called "San Casciano a Decimo" because it stood on the tenth milestone of the Roman road from Florence. It became important under Florentine rule, and in fact it was granted its first construction by the Florentine Bishops in 1241. Later, in 1272, San Casciano was governed by the Florentine Republic. Enrico VII, on his trip down the Italian peninsula, spent a few days in San Casciano in December 1312. 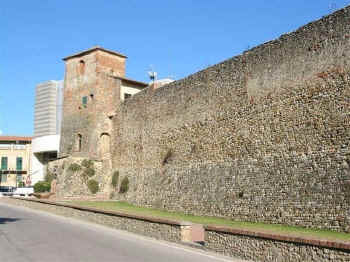 In 1326 Castruccio Castracani fired the town. Later, 1343, Gualtieri di Brienne, Duke of Athens and Lord of Florence, began to fortify it. 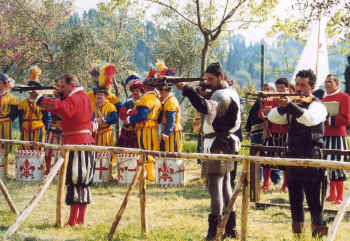 The Florentines considered San Casciano, like Empoli and many other Tuscan towns, to be a strategic point of defence. In 1335, they built a Cassero (castle) in San Casciano, and surrounded it with thick walls and towers. The Grand Duke Ferdinando II donated the Cassero to Giovanni Santi Lucardesi, known as "The Indian", and this later became a Benedictine convent. San Casciano possesses several buildings of artistic importance, among them the 1335 Church of the Misericordia, previously Santa Maria del Prato, in Gothic-Tuscan style. Inside the Chapel of La Collegiata you can see, on the right, a XIV century baptismal font and a lunette with a Madonna and Saints; at the third altar on the left is an "Annunciation" in the style of Ridolfo Ghirlandaio. The Church of San Francesco, of 1436 and altered in 1492, is also worth visiting. It contains a Madonna and Child with Saints, a painting by Biagio di Antonio of Florence. In the convent refectory there is a fresco showing the "Last Supper", attributed to Passignano. Podere Capiteto is located only 3 km from Impruneta and is within easy reach of Florence by city bus (20 minutes). We offer three holiday apartments for 2 (+1) persons on our olive farm. Enjoy our large swimming pool and the magnificent views over Florence and the valley of the Arno. 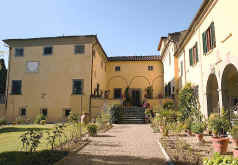 A place to stay in the cool Tuscan hills while still being able to visit the museums of Florence whenever you please. More about Agriturismo Podere Capiteto. The museum is located in the Church of Santa Maria del Gesù and there are numerous important works of art and objects of worship from isolated churches of the surrounding area, which were either abandoned or destroyed. Works by Coppo di Marcovaldo, A. Lorenzetti, L. Benivieni, Neri di Bicci. Click here for more details of the art displayed in the Museum. This church was built in 1304 and, despite transformations in 1600, still maintains its original Gothic appearance. Inside one of the most substantial artistic patrimonies of the Florentine province is on display: a Crucifix with a 14th century gold background by Simone Martini, the pulpit by Giovanni di Balduccio and 17th century paintings. The collegiate church of San Casciano was rebuilt between 1793 and 1796 on the site of a smaller 13th century church. It contains an Annunciation by Frà Paolino from Pistoia and beautiful crucifixes from the studios of Verrocchio and Baccio da Montelupo. The church contains a valuable Madonna with St. Mary Magdalene and St. Francis by Biagio d’Antonio from the end of the 15th century and a 14th century crucifix. 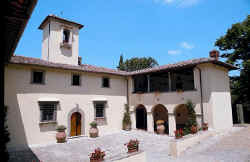 The convent of the Franciscan Monks was built by Girolamo Castrucci, citizen of San Casciano, in 1492. The portico dates from 1749. Today the church is a monastery of the Clarisse nuns. There is a Last Supper dated 1562 by L. Cresci in the refectory. 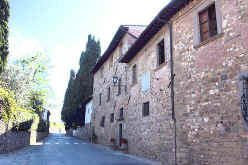 It is located on the left side of the road connecting San Casciano to the hamlet of Mercatale. It is a simple building with a single nave, with a glazed terracotta apse depicting the Adoration of the Child by Andrea della Robbia. The convent, also simple and austere, is dedicated to Sant’Andrea Corsini and dates from the mid 1600’s. Built in 1354 and 1356 by the Florentine Republic to strengthen this area on the way to Siena, it had crenellated towers and four gates at the cardinal points. The Porta al Prato gate, the small tower and long tracts of walls remain today. Tradition suggests that the most ancient parish church of the area was built in 774. The first written documents date back to the 11th century. The church underwent a transformation in the 18th century. It has a three-nave basilica plan and a 14th century bell tower. The exterior of the church has the typical rustic romanesque stone facade. The interior was renovated in the 16th century. There is an altar piece in glazed terracotta attributed to Giovanni della Robbia and a Renaissance cloister with a double loggia. Even if it has been changed over the centuries, the church still demonstrates its romanesque origin. The interior has three naves on quadrangular pillars and arches. The upper part of the facade is originally from the Middle Ages. This house was built as a country home for the Machiavelli family in the 13 C and was restored and renovated at the beginning of the 16 C. The villa was a country retreat and later the place of exile of Niccolò Machiavelli. 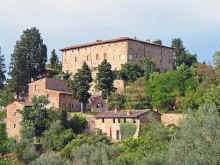 The Machiavelli family were also the owners of the nearby Castello di Bibbione and the Villa Poggio Torselli. Visits by appointment Wednesday through Sunday. 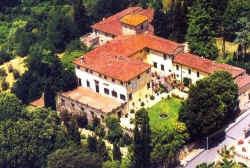 Formerly the property of the Buondelmonti family and the Machiavelli family, today it is owned by Rangoni Machiavelli. We have had information about this castle since 960. On the exterior, the building demonstrates its imposing character, halfway between a fort and a 16 C lord’s country residence. A magnificent building by Santi di Tito of the end of the 16 C with a square plan dominated by two tall towers on the facade, built on a pre-existing mediaeval nucleus. It has belonged to the Corsini family since 1427. This splendid 15 C villa once belonged to the Machiavelli family. 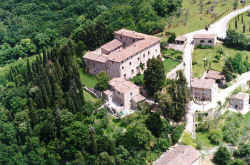 The Villa Poggio Torselli consists of a large rectangular structure with two wings which house service areas. The inner courtyard is no longer present, having been replaced by a salon which occupies the central part of the building. The famous garden of Villa Poggio Torselli probably dates from the late 17 C, and consists of an italianate garden divided into two terraces to the south and an English park area in to the north. In the upper terrace on the south side, the original arrangement with flower beds has been preserved along with a very ingenious irrigation system, one of the best preserved of Tuscany. 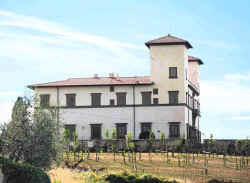 More about Villa Poggio Torselli. 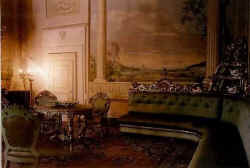 The villa originally belonged to the Borromeo family and passed along to the Capponi family during the 1700’s. It has a 15 C plan and the entrance is a stairway and large terrace. The main facade has three arches – today bricked up, with one containing the entrance to the restaurant. Hours 3:30 – 6:00 pm. Cited in 1057. The belvedere is located on the hill of Montefolchi. Two wings which form a courtyard on three sides have been added to the original rectangular building with its tower. Vorresti pubblicizzare la tua attività su questo sito web per San Casciano Val di Pesa e ricevere traffico in entrata dalla nostra rete di più di 50 portali relativi? Clicca qui per ulteriori dettagli in merito alla nostra soluzione integrata per una presenza su internet piena di successi. San Casciano in Val di Pesa © ammonet InfoTech 1998 - 2017. All rights reserved.